With a hundreds of years tradition in pastries, Turkey offers us unique flavors that you definitely have never tasted before! 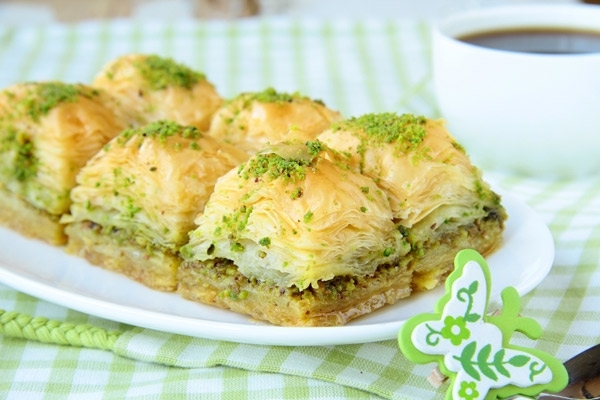 A delicious desert, made of layers of filo filled with chopped nuts which held together with syrup or honey. It is usually served at room temperature, often garnished with ground nuts or ice cream! The best way to describe this Turkish classic is something like a mix between baklava and bread pudding. It’s actually a very simple dessert made from layers of rusk-like break saturated in syrup and topped with kaymak (a kind of clotted cream)! It is mainly prepared by baking some soft balls of pastry dipped in thick lemon flavored sugar syrup. A very tasteful choise! It is made from semolina, roasted in butter together with pine nuts, on very low fire for a long time and then left to rest with boiling hot milk, water, and sugar. Cinnamon is the most common dressing!